As a combined hybrid of detective, mediator, and enforcer, Roger Smith’s primary resource is his keen, analytical mind, but it doesn’t hurt to have a mansion filled with gadgets, his butler Norman, and his attractive assistant Dorothy to fall back on. 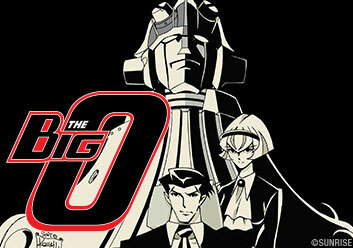 Additionally, for those times when cases end up “in dispute,” he also has the biggest, baddest back-up that any cop or small army could ever hope for: the Big O, a giant robot loaded with all the extras. A new client requests that Roger negotiate a deal with kidnappers, for the release of his daughter. Before long things go bad and Roger calls upon his secret weapon. Roger goes looking for Dorothy and finds himself at a club called Nightingale. When Beck shows up too, things start to go sideways for our hero. Angel, from the Paradigm Corporation, hires Roger to look into the cause of recent power outages. He soon discovers what waits in Electric City is more than he expected. Roger reluctantly agrees to retrieve a manuscript from a man named Michael Seebachhas. The biggest problem with this job might not be that Michael disappeared months ago. Roger’s latest case to find a man named Bonny just might also be connected to some strange occurrences with a string of military police vehicles crashing. In hopes of improving Dorothy’s piano skills, Roger takes her to meet his friend Instro. Unfortunately, their visit is interrupted by a stranger. While Roger is investigating the fishermen’s tale of a sea titan, Angel shows up and the two head into the watery abyss. Dastun’s men are investigating a woman’s murder when Dorothy finds a lost cat. When the owners come to retrieve the cat, it and Dorothy are kidnapped! Mr. Wise hires Roger to negotiate for the return of his kidnapped son, Francis. However, the end game for this job is more elaborate than Roger realized. Dastun keeps dreaming about a woman in white and after seeing her at a crime scene, he is positive that she is behind it! With Roger’s help, he’s determined to catch her. Heaven’s Day is coming up and Roger is refusing to let anyone in his house celebrate it, upsetting Dorothy. While trying to reconcile with her, Roger’s skills are requested. Act 12: Enemy as Another Big! After accepting a new assignment, Roger learns of a new MegaDeus nearby! He takes Big O there and finds this new foe is covered in bandages. As Roger deals with his constant flashbacks, there’s a recent string of murders. All of the victims claim to have memories from before “The Event”. Can Angel help him?